Prawns are a great Aussie Christmas tradition. 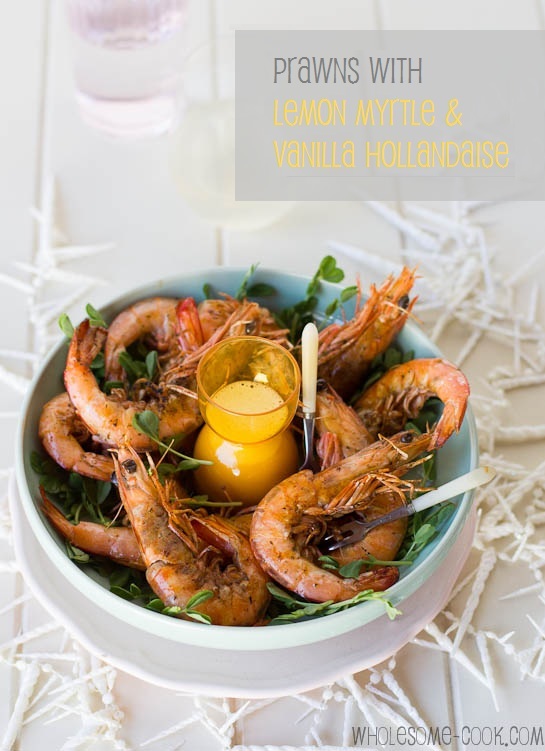 This fine-dining inspired recipe for prawns comes with a velvety smooth Lemon Myrtle and Vanilla Bean Hollandaise sauce, which also goes well with poultry and steak. Prawns can be barbecued, grilled in a pan or even bought cooked and peeled for convenience. Dairy- and gluten-free. Growing up in a family where cooking for Christmas began a week before the actual Day, seemed quite the norm for me. As meals were planned and prepared in advance, you could smell Christmas in the air days before the actual celebrations began. Then there was carp. Yep, carp. Swimming in the bath tub, waiting to be prepared in aspic or a la Grecque… both very traditional dishes at the Polish Christmas table. Since moving to Sydney, not much has changed when it comes to my family’s Christmas. The same traditional – quite heavy for the Australian summer, dishes grace the Christmas table. Whenever I mention these stories to Mr Chipconnoisseur, he shakes his head in disbelief at the amounts of time and effort going into the food. I have to be honest, as much as I love cooking, preparing food for a week prior to any celebration, no matter how significant seems a little excessive. I am yet to host my own Christmas lunch, but I think that when the time comes, I will mix and match the best of both worlds and traditions. Hassle-free cold seafood will feature prominently on the table with a good serving of this festive and slightly native Lemon Myrtle and Vanilla Hollandaise sauce for dipping. So, tell me, what unusual Christmas traditions will you be keeping alive or what new ones are you happy to introduce in your own home? The following recipe was created for Brookfarm, using their wonderful first cold pressed Lemon Myrtle macadamia oil which can be found in many delis and online. Lemon Myrtle powder can be found in most Australian delis and some supermarkets. Prawns can be barbecued or grilled in a pan. I used green prawns in this recipe. Cutting the prawns in half helps the meat come out of the shell and leaves most of the intestinal tract inside. Dairy-free and Gluten-free. Split the prawns (do not cut through the shell) from the belly side with a sharp knife and place in a clean bowl. Mix together oil and dried lemon myrtle. Pour over the prawns and toss gently with tongs to spread the marinade evenly around. Allow to marinate for 15 minutes in the fridge. In the meantime, prepare the hollandaise. Place oil and lemon myrtle in a small pan. Cook over low heat just until the herbs begin to sizzle. Remove from heat and set aside. Place egg yolks and lemon juice into a food processor or measuring jug and pulse or whisk with an electric whisk until pale and slightly foamy. Add vanilla bean paste and honey. Continue to whisk or pulse as you add the warm oil in a thin trickle (reserving the last tablespoon or so that may contain the herbs to pour over prawns just before grilling). Set Hollandaise aside until serving. Preheat barbecue or grill pan until hot. Cook prawns for 3 minutes on each side. Arrange cooked prawns on a platter decorated with some salad greens and serve with the hollandaise for dipping. YUM! I can’t believe you had live fish swimming in your bath tub! I’m not sure I could handle that… as for our own traditions, we try to get a new Christmas bauble every year for our tree with the date on it. That is a lovely touch Anne 🙂 I’ve been thinking of a instigating a similar tradition here. 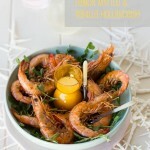 Love the grilledprawn recipe as it uses lemon myrtle! 5 Soused fish: nice and spicy after being fried! 6 And all the goose and duck your ovens would take, eaten with sauerkraut and spuds, of course! Heaps more, but that is enough to keep up 🙂 ! I love seafood on Christmas Day! Every year we have a seafood platter between brunch and our early dinner, it’s our easy lunch. These look wonderful! Thank you! Seafood lunch is perfect in my opinion, especially in this climate! Love those photos Martyna. Prawns are a staple at our place. Looking forward to swapping the thousand island sauce for this… thank you! It’s quite lovely actually – has a herby lemon flavour. Great to add to schnizel crumbing or sprinkle over grilled fish, and of course delicious infused into Brookfarm’s oil. Seafood on Christmas Day in Australia is a must have for me nowadays, Marty. My mother, Hungarian, as you know, would crumb and fry a pile of chicken pieces and also prepared a bucket of the most beautiful tasting potato salad. There were also carnival doughnuts filled with conserve and Beigli with poppy seeds and also walnuts and sultanas. Peter and I decided to spend the day at home again this year. Last year was the first time in 30 years I had been able to have Christmas in my own home and I LOVED IT! 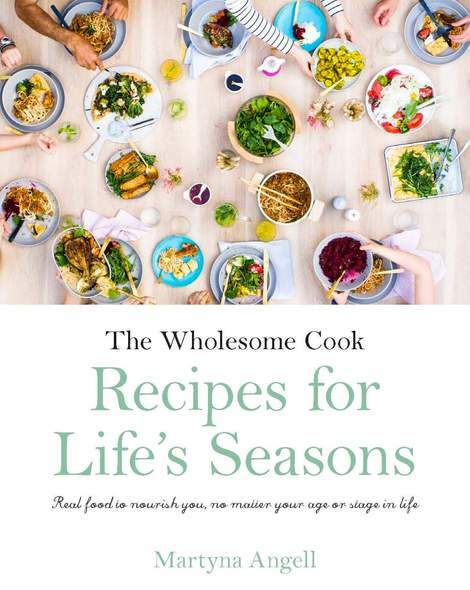 Great recipe and lovely photos. Thank you Lizzy. Christmas at home is one of those things I have to try one day – maybe next year. Those conserve-filled donuts sound amazing as does Beigli (we had something similar called makowiec). Seafood and Christmas go together so well. We’ve been putting an Aisan twist to our Christmas fish – poached in coconut milk but these Aussie prawns sound just as nice! Love Brookfarm products. My Christmas foodie traditions have changed a lot in the last few years, what used to be a big family affair with a roast, seafood and salads galore has now become a Christmas Eve Polish celebration with my partner’s family and their traditional fare. Oh how I miss prawns on December 25th! We are big fans of seafood at Christmas in my family too… but… as Italians, a massive dish of homemade lasagna is also in the mix… ours is an odd family feast on Christmas day. Who doesn’t love lasagna!! I guess that’s the thing – living in Australia we get all of the influences in while keeping some of the traditions. It’s great, isn’t it? These photos make my tastebuds twitch. I love prawns and that sauce looks wonderful. I think we stick to all the usual Christmas traditions and don’t do anything too unusual. I’ve never tried that, though I’ve had the prawn head shells cooked till crisp. Quite nice actually. Thanks Bam, sounds great! Love that you’ve started your own tradition too! A wonderful dish! So flavorful and refined. I love such light Christmas dishes and also eat lots of seafood on this occasion. The sauce sounds very unusual and tempting. Please do not mention the carp… It’s the only fish I hate (apart from the farmed salmon that everyone seems to go crazy for). Yes, no more carp for us now… As for salmon I have been doing some reading recently and at least the Australian salmon industry is trying hard to go “free-range” with the fish. Oh the flavours sound amazing! 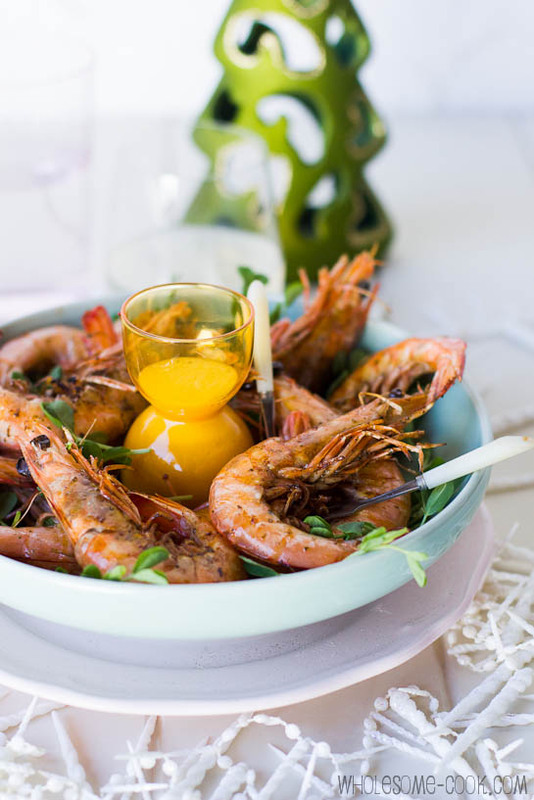 We have prawns every Christmas in my family and I will definitely be making this to bring!